I've been watching a lot of the food show Mind of a Chef on Netflix lately. 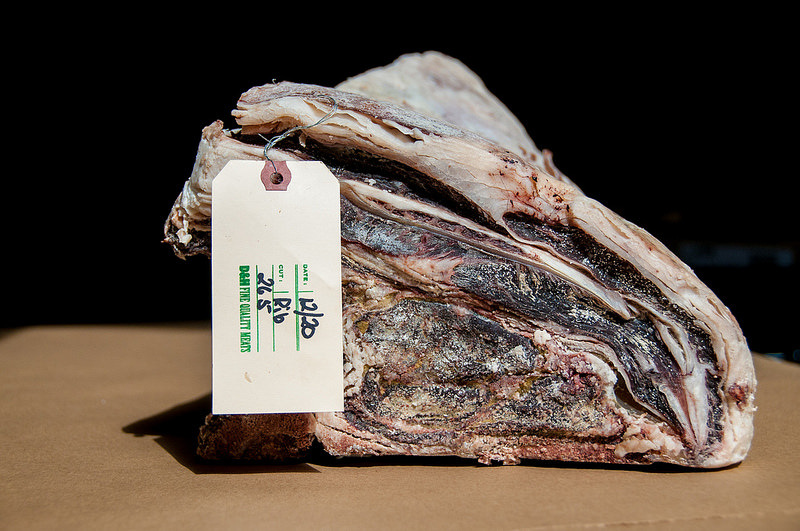 In a couple of episodes, a chef visits a locale where meat is being cured. I've noticed there consistently appears to be fungi (mould) growing on the meat, whether it's skerpikjøt (mutton dried using the wind on the Faroe Islands), dry-aged beef, country ham, or dry-cured sausage. These fungi, having managed to grow to such an extent as to be visible to the naked eye, obviously influence the characteristics of the meat. One thing fungi do particularly well is release all sorts of interesting substances into their surrounding environment. For fungi living on meat, these often include enzymes capable of breaking apart lipids and proteins. This tenderizes the meat while increasing levels of certain flavourful amino acids and free fatty acid derivatives. In less fun news, many of the fungi able to grow on food also synthesize and secrete mycotoxins (poisons made by fungi, which tend to cause cancer and/or organ damage) and antibiotics (e.g. penicillin). Food scientists who study cured meats are often on the lookout for these harmful substances. In addition to their production of meat-altering secretions, fungi growing on the outside of meats can form a protective coating of mycelium (a dense network of cell-filled filaments we usually see as moulds growing on bread, cheese, or fruit). This barrier limits exposure of the meat to oxygen and light, ensuring a stable colour and flavour while preventing meat fats from going rancid. 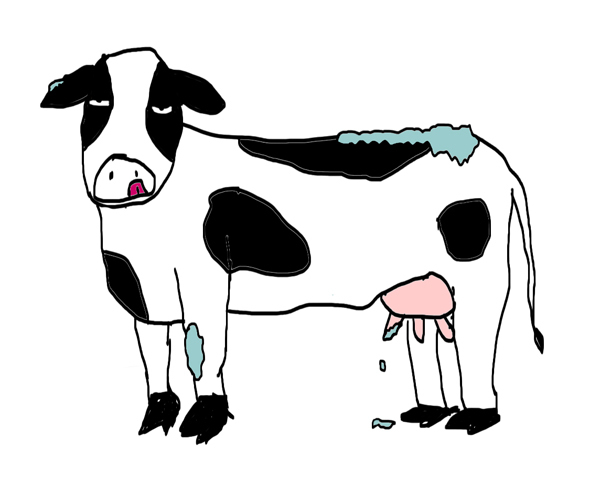 It also can block the entrance of undesirable microbes (pathogens, agents of spoilage) into the meat. Let's focus in on a couple of meat products, starting with beef. Dry aging beef means hanging a recently slaughtered cow part in a refrigerator to cure for a couple of weeks. During this time, fungi will often grow on its surface, producing enzymes able to penetrate into the meat and break down its tougher components (e.g. collagen). There doesn't appear to be a whole lot of research out there on the fungi involved in the dry aging of beef, but one recent conference paper I came across reported finding Cochliobolus sativus and Mucor racemosus on subprimals dry aged for 3 weeks. Both of these fungi infect corn, and M. racemosus has also been isolated from Camembert cheese, so I'm guessing they were already present on cows brought in from farms for slaughtering and then found their way onto the hanging meat. Anyway, the big concern for the authors of the paper was whether or not fungi growing on the beef were producing mycotoxins, specifically liver-hating aflatoxins. Fortunately, they didn't find a significant difference between aflatoxin levels in dry aged versus non-aged bits of beef, and levels in all of the meat samples they examined were well below the regulatory limit set by the US government. Whew. Other fungi known to be associated with dry aged beef include Thamnidium elegans, Mucor mucedo, and Chaetostylum fresenii. The first two appear as pale gray patches called 'whiskers' on the fatty parts of refrigerated red meats. This refers to their growth of tall specialized filaments (sporangiophores) sticking up into the air, at the tops of which spores are formed (in sporangia). Chaetostylum fresenii has also been found growing on refrigerated fish and can survive bouts of freezing below -20°C. 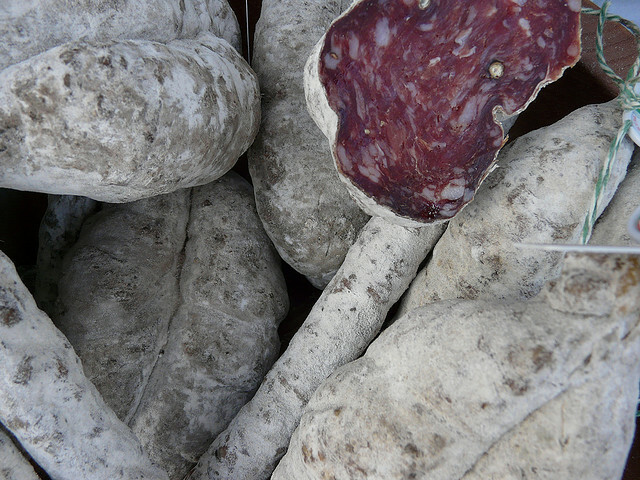 Moving on to our next meat, dry-fermented sausages owe both their flavour and appearance to fungi. 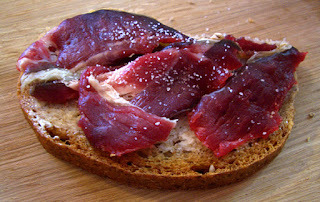 As with other cured meats, fungal growth can create enjoyable tastes and smells by bringing about the degradation of lipids and proteins. It also is used to add an aesthetically pleasing white or whitish grey coat to the surface of sausages. Producers will often use commercial starter cultures of particular fungi to ensure a consistent appearance and flavour. Two big players in the starter scene are Penicillium nalgiovense and Penicillium chrysogenum. Notably, both can produce the antibiotic penicillin, which is bad to have in a sausage since some folks are allergic to it and it could potentially lead to the development of harmful drug-resistant bacteria in our guts. Other sausage makers will just hang the sausages and allow them to become inoculated with whatever fungi are floating about in their production area. This is akin to spontaneously inoculated lambic and coolship beers where a specific community of microbes are already present in the brewery rafters and thus ensure a relatively consistent product. In one study I found on dry-fermented sausages produced in Colonia Caroya (a sausage-making hotbed in Córdoba, Argentina), their fungal inhabitants belonged to seven genera: Penicillium, Aspergillus, Mucor, Cladosporium, Scopulariopsis, Geotrichum, and Eurotium. These communities varied depending on whether the sausages were produced in the summer or winter. For example, Aspergillus ochraceus was found in most of the summer-made sausages but none of the winter-made ones, with this being explained by the higher temperatures in the ripening rooms during the summer. The presence of A. ochraceus isn't good since it gives sausages an unwanted yellowish gold colour and can contaminate them with mycotoxins. Ending off our meat tour, dry-cured ham is also typically rendered slightly fuzzy and appreciably more flavourful by the growth of fungi. The particular fungi that end up growing on the surface of a ham tend to be characteristic to the part of the world (e.g. Jinhua, China) where it is being produced, thus contributing to location-specific flavour profiles (meat terroirs, if you will). Hams are usually prepared by being covered in salt, which works its way into the meat, then dried for a while, and finally placed in a cellar for aging. The length of the whole process depends on the type being produced, but can take up to two years. Unlike dry-cured sausages, dry-cured ham usually isn't inoculated with a starter culture of fungi. Several species of Penicillium known to be capable of breaking apart fats are often residents of dry-cured ham. A concern with these fungi is that some of them produce ochratoxin A, which is capable of damaging the liver and kidneys of those who ingest it. The long aging times required for dry-cured ham can mean higher levels of the mycotoxin than might be found on other meats. One of the fungi responsible for contaminating ham with ochratoxin A is Penicillium nordicum, which has been found hanging out in pure table salt. P. nordicum produces ochratoxin A in order to increase its competitiveness in salt-rich habitats, which are fairly stressful places for organisms to live. 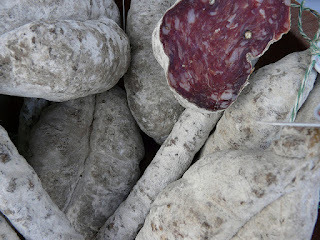 UPDATE: Check out this interesting forum thread from 2009 discussing green mould on dry-cured sausages, and this article on a newly discovered (2015) species of green mould isolated from salami. Alapont C, Martínez-Culebras PV, López-Mendoza MC. 2015. Determination of lipolytic and proteolytic activities of mycoflora isolated from dry-cured teruel ham. Journal of Food Science and Technology 52(8):5250-5256. Campano SG, Kotula AW, Kinsman DM. 1985. Antibacterial nature of molds isolated from aged beef. Journal of Food Protection 48(8):699-701. Canel RS, Wagner JR, Stenglein SA, Ludemann V. 2013. Indigenous filamentous fungi on the surface of Argentinean dry fermented sausages produced in Colonia Caroya (Córdoba). International Journal of Food Microbiology 164(1):81-86. Lowry PD, Gill CO. 1984. Temperature and water activity minima for growth of spoilage moulds from meat. Journal of Applied Bacteriology 56(2):193-199. Rodríguez A, Medina Á, Córdoba JJ, Magan N. 2014. The influence of salt (NaCl) on ochratoxin A biosynthetic genes, growth and ochratoxin A production by three strains of Penicillium nordicum on a dry-cured ham-based medium. International Journal of Food Microbiology 178:113-119.